When attending a service in All Saints, writes Richard Porch, I happened to glance up at one of the stained glass windows. I was at once struck by the design and wondered what had brought it about. I was looking at the commemorative 'Lifeboat Window' and as I searched for information on it, it really was an example of 'history you can see'. 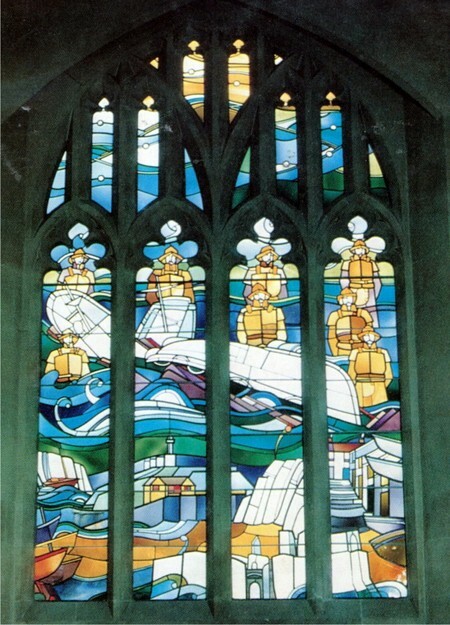 For the window depicts the famous lifeboat disaster of 23rd April 1947 when the Mumbles lifeboat lost its entire crew of eight members while attempting to rescue the crew of the SS Samtampa. The latter was a 7,219 'Liberty ship' built in America in 1943. 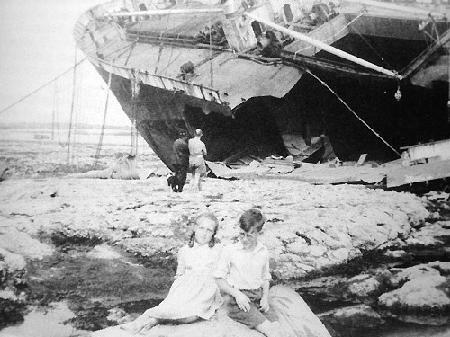 She was on her way to Newport from Middlesborough when she ran aground on the rocky ledges of the Sker Point near Porthcawl. Her captain decided to try and ride the storm out at anchor, however her cables snapped and in just 80 minutes she was sundered into three pieces. 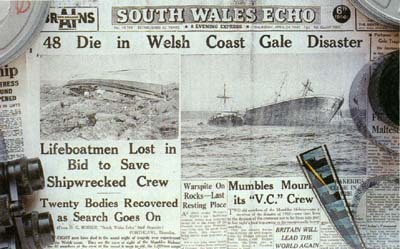 The Mumbles lifeboat was launched at 7:10pm and began its fateful journey towards Porthcawl. It was called the Edward Prince of Wales and was the first motorised Mumbles lifeboat and had been in service since 1924. All that can be known for sure is that the lifeboat reached the scene before being capsized by the sea conditions with the loss of all the crew. It was the first time that a lifeboat of this design had been capsized. 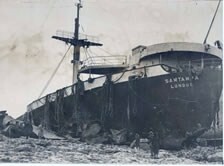 The crew of the Samtampa also perished that storm-lashed night bringing the death toll to a tragic 47 lives lost. 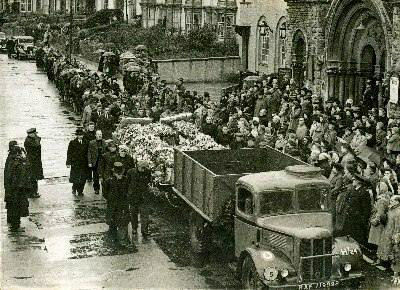 All the bodies were washed ashore the following day. The lifeboat crew that perished was as follows; Coxswain William J. Gammon, 2nd Coxswain William Noel, 1st Mechanic Gilbert Davies, 2nd Mechanic Ernest Griffin, Boatman William Thomas, Boatman William Howell, Boatman Ronald Thomas and Boatman Richard Smith. The Lifeboat Window depicts the tragedy of that night. 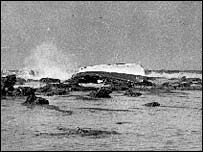 It shows the capsized lifeboat in the middle of the picture and the eight crew members in the water surrounding it. Also in the design can be seen two segments of the Samtampa with the whole scene set in a swirling sea of blue and white glass. At the bottom of the window can be seen the lifeboat house, a village street in Mumbles and Mumbles lighthouse. Tim Lewis who was head of the school of Architectural Glass at Swansea at the time designed the window. For a piece of modern stained glass there is a residual art nouveau feel to it and though the scene depicted is turbulent, the eye rests on it with ease. 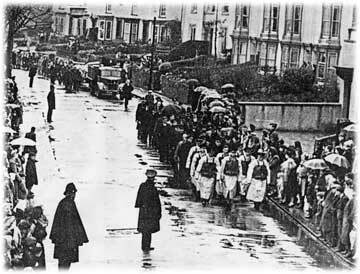 Since the Mumbles lifeboat station was established in 1835, no fewer than 18 lifeboatmen have made the ultimate sacrifice, many are buried at Oystermouth cemetery. On the other side of the balance sheet the station has saved 797 lives and won 19 RNLI medals, one gold, silver and five bronze. The majority of the RLNI lifeboat crews are volunteers. 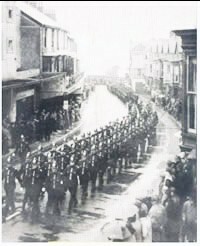 This article is an extract from Richard Porch's book 'Swansea: History You Can See', published in 2005 by Tempus Publishing / City & County of Swansea.